Was the scary report too conservative? The U.N. climate report released this week had some stunning revelations, claiming that the 2020s could be one of humanity's last chances to avert devastating impacts. But some say its authors were being too cautious. The Intergovernmental Panel on Climate Change report states in plain language that averting a climate crisis will require a wholesale reinvention of the global economy. By 2040, the report predicts, there could be global food shortages, the inundation of coastal cities and a refugee crisis unlike the world has ever seen. A number of scientists contend that the report wasn't strong enough and that it downplayed the full extent of the real threat. They say it doesn't account for all of the warming that has already occurred and that it downplays the economic costs of severe storms and displacement of people through drought and deadly heat waves. The world has a smaller carbon budget — the amount of fossil fuels that can be consumed before a critical tipping point is reached — than the report states, said Michael Mann, a professor of atmospheric science and director of the Earth System Science Center at Pennsylvania State University. He published two papers with other researchers in recent years to show that the "preindustrial" baseline used for the report should not be based on late 19th-century data. The Industrial Revolution was already underway by then, he said, and humans had warmed the world by several tenths of a degree. "We are closer to the 1.5C and 2.0C thresholds than they indicate and our available carbon budget for avoiding those critical thresholds is considerably smaller than they imply," Mann wrote in an email to E&E News. "In other words, they paint an overly rosy scenario by ignoring some relevant literature." In other places, the report fails to highlight some major risks from climate change, said Bob Ward, policy and communications director of the Grantham Research Institute on Climate Change and the Environment at the London School of Economics. In the summary for policymakers, the section that receives the most attention, it does not mention population displacements or conflict, he said. It also does not describe any risks except for destabilization of the Greenland and West Antarctic ice sheets, he said. "The danger of omitting these big risks is that policymakers underestimate the scale and urgency of the situation," Ward wrote in an email. "The authors may have left them out because they are uncertain. However, policymakers may misinterpret their omission as a sign that the authors examined the risks and decided either that the impacts would be unimportant or that the probabilities are zero. It is the difference between an academic literature review and a professional risk assessment." The IPCC report downplays the real costs of climate change, and its contribution to natural disasters, because it can be difficult to tease out the exact role of human-caused climate from a hurricane or other disaster, said Kevin Trenberth, a senior scientist in the Climate Analysis Section at the National Center for Atmospheric Research. He said the IPCC could make stronger statements about attribution of human-caused climate change to extreme weather. The report could also be stronger in connecting the costs of more extreme storms with human-caused climate change, he said. Another challenge is that the report relies on too many studies or reports that explore a single country, such as Iran or Romania, without looking at larger regional trends, Trenberth said. 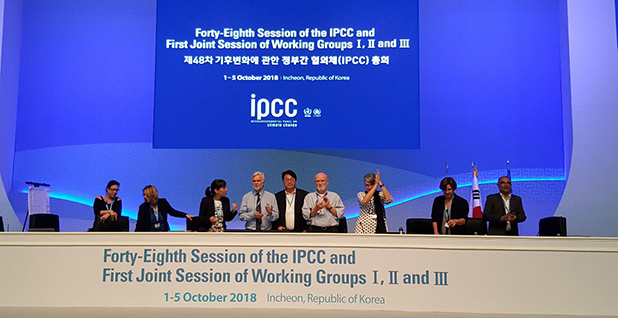 "The IPCC tends to be quite conservative both in terms of the way in which they do things but because you're dealing with the lowest common multiple of a large number of people from many different countries who have a more limited background in terms of dealing with the material they're actually assessing," he said. The report also ignores "wild cards" in the climate system, or self-reinforcing feedbacks, said Veerabhadran Ramanathan, a professor of climate sciences at the University of California, San Diego. That includes thinning Arctic sea ice, which allows the ocean to absorb more heat, causing even more ice loss and diminished reflectivity in the region, he said. Such feedback loops have a real possibility of pushing the planet into a period of chaos that humans cannot control, he said. Ramanathan said the report also takes solid research, such as his finding that 1.5 degrees Celsius of warming could be reached by 2030 to 2035, and downplays it in favor of being overly cautious. "I am a little bit concerned policymakers who are skeptical about all this are going to say, 'They're talking about half a degree difference; I'm not going to worry about that,'" he said. Other scientists criticized the report. Some said it's understated, while others described it as overly alarming. One area that deserves more attention is the higher-risk scenarios, which have more uncertainty but also hold more devastating implications, said Andrea Dutton, a sea-level-rise expert at the University of Florida. "The take-away message is this: The scientists who have been studying climate change and writing these reports are some of the very same people who have the highest concern about the potential impacts," she said. "If those most knowledgeable about the situation are also the most concerned, then it is time for the general public not just to start paying more attention but convert this concern and despair to action." The research is presented in an appropriate and evenhanded way, evaluating risks and highlighting uncertainties where appropriate, said Gavin Schmidt, climate scientist and director of the NASA Goddard Institute for Space Studies. It's also something that will be verifiable in the lifetimes of many of the scientists who contributed to it, he said. That shows the degree of confidence they have in their predictions, he said. "This is climate scientists really putting their predictions where their mouth is. This isn't something that is going to happen in centuries; this is what we're predicting is going to happen within decades," Schmidt said. "I think that's a statement about our confidence in what the trajectory is for many of these aspects and a warning to the people who are going to have to deal with it."